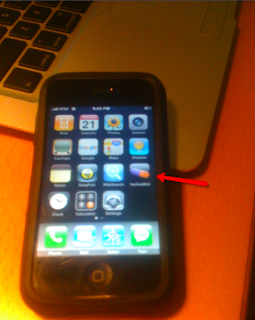 When you save hackaddict as a webicon on your iPhone homescreen the hackaddict pill is saved as the icon (instead of a screenshot of the site). Load up your favorite image editing software and create a PNG file 57 x 57 pixels. (You do not need to round the corners or put the gradient on it - iPhones do this automatically). Save your custom icon to a webserver that you can link to (I have a dreamhost account, but you can upload it to sites like divshare for free and link to it). Congratulations! You are now the envy of your blogging friends with your brand new blog iPhone icon!